Sometimes we get to work with truly unique individuals and businesses, this was one of those times. BoldWater is pleased to be working with the newest, most comfortable, power catamaran tour serving the Virgin Islands – The Jost Boat. 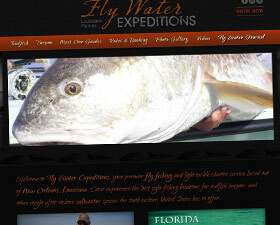 Capt Greg Dini, one of Louisiana’s most prolific fly fishing guides, chose BoldWater to refresh his branding and website design to better align with his other marketing expressions. BoldWater worked closely with the newest river tour company on the Indian River lagoon to develop their brand identity and web presence. BoneFish Unlimited Turks and Caicos is the new website of Capt. Barr Gardner and Capt Will Vallely located in the exotic Turks and Caicos Islands.